Mack: Oh, these best friend greetings, they get longer every year. Mater: [Voice-over reading the letter] By the time you read this, I'll be safely on an airplane heading home. I'm so sorry for what I did. Lightning McQueen: [Reading Mater's Letter in the Hotel Lobby] I don't want to be the cause of you losing any more races. I want you to go prove to the world what I already know: that you are the greatest racecar in the whole wide world. Your best friend, Mater. Lightning McQueen: I didn't really want him to leave. Luigi: P.S. Please tell the hotel I didn't mean to order that movie. I thought it was just a preview and I didn't realize I was paying for it. Luigi: P.P.S that's funny right there. Luigi: P.P. there's uh a few more pages of P.S. 's here. Lightning McQueen: Well at least I know if he's at home, he'll be safe. Mack: Those two are perfect for each other. Rod 'Torque' Redline: Okay, McMissile. I'm here. It's time for the drop-off. Professor Z: Allinol must be finished for good. McQueen can NOT win the last race. Lightning McQueen must be KILLED. Sally: [trilling the R's] Francesco Bernoulli. No wonder there's a crowd. Lightning McQueen: Wait, why do you know his name? And don't say it like that. It's three syllables, not ten! Lightning McQueen: Mater, just cut to the chase. Sir Miles Axlerod: What? Me? You got to be crazy. Mater: . The same bolts that hold together that old British engine from the photograph. Holly, show that picture! Mater: And then I remembered what they said about old British Engines, if there ain't no oil under 'em, there ain't no oil in 'em. Sir Miles Axlerod: What is he talking about? Mater: It was you leaking oil at the party in Japan. You just blamed it on me. Sir Miles Axlerod: Electric cars don't use oil, you twit! Mater: Then you're fakin' it! You didn't convert to no electric. Mater: We pop that hood, we're gonna see that engine from that picture right there. Sir Miles Axlerod: This lawry's crazy! He's gonna kill us all! Sir Miles Axlerod: Stay away! Sir Miles Axlerod: But Sir Axelrod created the race, Mater. Why would he want to hurt anyone? Mater: To make Allinol look bad so everyone would go back to usin' oil. I mean he said it himself with that disguised voice. Sir Miles Axlerod: Disguised voice, what are you talking about? You're nuts, you are! The Queen's Grandson: This is going nowhere fast, we really should go, Grandmother. The Queen: One moment, I'd like to see where this is going. Finn McMissile: Mater, he created Allinol. Mater: Yeah, but what if he found that huge oil field just as the world was tryin' to find somethin' else? What if he came up with Allinol to make alternative fuel look bad? Sir Miles Axlerod: What if? You're basing this on a what if? Guards: All right, that's it, let's clear out! Sir Miles Axlerod: Wait, somebody save me! The lawry's crazy. Keep away you idiot! Sir Miles Axlerod: Someone do something! Sir Miles Axlerod: You're insane, you are! DEACTIVATE! Mater: Wow. 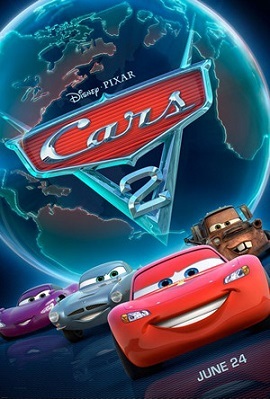 I can't believe they renamed the Piston Cup after our very own Doc Hudson. Lightning McQueen: I know Doc said these things were just old cups, but to have someone else win it just didn't feel right, you know? Mater: Well, Doc would've been real proud of you. That's for sure. [Finn McMissile has just tricked the lemons into thinking they've killed him after escaping from the oil platform] Grem: He's dead, Professor. Professor Zundapp: Wunderbar. With Finn McMissile gone, who can stop us now? Mater: Mater, Tow Mater - that's who - is here to help you! Finn McMissile: [Captured with Holley in the Big Bentley clock] What are you doing? Finn McMissile: Good job! Quick thinking, Holley! Mater: McQueen, they're gonna kill you! Acer: Finn McMissile? But you're dead! Finn McMissile: Then this shouldn't hurt at all! Lightning McQueen: [over the phone] Yeah, hi, this is Lightning McQueen. Francesco Bernoulli: The Lightning McQueen, eh?! Lightning McQueen: Look, I don't appreciate my best friend being insulted like that. Francesco Bernoulli: McQueen, that was your best friend? Ohhh... There's a difference between you and Francesco! Francesco knows how good he is. He doesn't have to surround himself with tow trucks to prove it. Lightning McQueen: You know, those are some strong words coming from a car that is so fragile. Francesco Bernoulli: FRA-JILL-AY! HE CALLS-A FRANCESCO FRA-JILL-AY!? Not so fast, McQueen! Lightning McQueen: "Not so fast." What is that? Your new motto? Francesco Bernoulli: Motto?! [Rants and curses rapidly in Italian] ...RIDICULO!! Finn McMissile: Who are you with? FBI? CIA? Mater: Let's just say I'm Triple-A affiliated. Professor Zündapp: [after receiving orders from Miles Axlerod, the Lemon Mastermind] Of course. [to his fellow Lemons] Allinol must be finished for good. McQueen cannot win the last race. Lightning McQueen must be killed! Mater's Computer: Gatling gun. Request acknowledged. Mater: Whoa, whoa, whoa! I didn't mean that kinda "shoot"! Mater: Mater, Tow Mater, that's who, is here to help ya. Hey, Otis! Otis: Heh-hey, Mater. I... uh... oh, gosh. I'm so sorry. I thought I could make it this time, but... [Otis tries to start to start his engine, but can't.] Smooth like puddin', huh? [sighs] Who am I kiddin'? I'll always be a lemon. Mater: Well, dad-gum, you're leakin' oil again. Must be yer gaskets. Hey, but look on the bright side. This is yer 10th tow this month, so that means it's on the house. Otis: You're the only won that's nice to lemons like me, Mater. Mater: Hey, don't sweat it. Shoot, these things happen to everybody, Otis. Otis: But you never leak oil. Mater: Yeah, but I ain't perfect. Don't tell nobody, but I think my rust is trying to show through. Grem: Hey, Professor Z! This is one of those British spies that we told you about! Acer: Yeah, this one we caught sticking his bumper where it didn't belong! Professor Zündapp: Agent Leland Turbo. [Leland's remains are revealed: he's been crushed into a cube. Finn gasps. A burst of flame behind Finn reveals his shadow on the platform below. Zundapp looks up and sees him] It's Finn McMissile! He's seen the camera! KILL HIM! Alexander Hugo: [to Ivan] Gremlins. Man, those are some ugly cars; looks like someone stole their trunks! Francesco Bernoulli: Ah, you heard it! Lightning McQueen prefers to be slow! Of course, this is not news to Francesco. When I want to go to sleep, I watch one of his races. After two laps, I am out cold! Crabby: Alright buddy, we're here. Right where you paid me to bring you. Question is, why? Finn McMissile: [comes out from the shadows on Crabby's stern deck] I'm looking for a car. Crabby: A car? Ha! Hey, pal. You can't get any further away from land than out here. Finn McMissile: Exactly where I want to be. Crabby: Well I got news for you buddy. There's nobody out here but us. Tony Trihull: [blows his horn] What are you doing out here?! Crabby: What does it look like, genius? I'm crabbin'. Tony Trihull: Well turn around... and go back where you came from. Crabby: Yeah? And who's gonna make me? [Tony reveals his bow-mounted missile turret] All right! All right! Don't get your prop in a twist! [Crabby turns away and begins sailing back] What a jerk. Sorry, buddy. Looks like it's the end of the line. Buddy? Grem: What are you laughing at? Rod 'Torque' Redline: Well, I was wearing a disguise. You're stuck like that. Professor Zundapp: Give it up, McMissile! Francesco Bernoulli: [at the Tokyo World Grand Prix party, Francesco spots Lightning] Ah! Lightning McQueen! Bona seda! Lightning McQueen: Uh, nice to meet you, Francesco. Francesco Bernoulli: Yes, nice to meet you too. You are very good looking. Not as good as I thought, but you're good! Mater: 'Scuse me, can I get a picture with you? Francesco Bernoulli: Ah, anything for McQueen's friend. Mater: Miss Sally is gonna flip when she sees this! Mater: She's Lightning McQueen's girlfriend. Mater: She's a big fan of yers. Francesco Bernoulli: Hey, she has a-good taste. Lightning McQueen: Well, Mater's prone to exaggeration; I wouldn't say she's a "big fan". Mater: You're right. She's a HUGE fan! She goes on and on about your open wheels here. Lightning McQueen: Well, mentioning it once doesn't qualify as going "on and on". Francesco Bernoulli: Francesco is familiar with this... reaction to Francesco. Women respect a car that has a-nothing to hide. Stephenson: [Stephenson, the train, is traveling to Porto Corsa, carrying Finn, Holley, and Mater] Finn, one hour to Porto Corsa. Finn McMissile: [inside one of the cars] Thank you, Stephenson. [a robot arm screws in an orange light on top of Mater] Holley Shiftwell: Yeah, I think that should just about do it. Holley Shiftwell: So Mater, it's voice-activated. But, you know, everything's voice-activated these days. Mater: What? I thought you's supposed to be making me a dee-sguise. Mater's Computer: Voice recognized. Disguise program initiated. Mater: Ha ha. Cool! Hey computer, make me a German truck! Mater: Check it out! I'm wearing Materhosen! Make me a monster truck! Mater: I vant to siphon your gas! Ha ha! Now make me a taco truck! Finn McMissile: [turns off the hologram] The idea is to keep a low profile, Mater. Luigi: [at the Tokyo party, Lightning, Mater, Luigi, Guido, Sarge, and Fillmore descend a spiral ramp] Guido, look! Ferraris AND tires! Let's go! Lightning McQueen: Oh ho ho! Look at this! Okay, now Mater, remember - best behavior. Mater: You got it buddy. Hey! What's that? Lewis Hamilton: [offscreen] Hey, McQueen! Over here! Lightning McQueen: [Lightning joins them] Lewis! Jeff Gorvette: Hey, Lightning! Can you believe this party? Mater: [Mater drives over to a small isolated room with glass walls on all sides, with a zen garden and zen master inside; Mater taps on the glass with his hook] Hey! you done good, you got all the leaves! Jeff Gorvette: Check out that tow truck! Lewis Hamilton: Man, I wonder who that guy's with. Lightning McQueen: Uh, heh heh. Will you guys excuse me for one little second? Lightning McQueen: Look, Mater, we're not in Radiator Springs. Mater: You're just noticing that? Boy, that jet lag really done a number on you. Uncle Topolino: Chi trova un amico, trova un tesoro. Lightning McQueen: What does that mean? Mama Topolino: "Whoever finds a friend, finds a treasure." Finn McMissile: My apologies, I haven't properly introduced myself. Finn McMissile, British intelligence. Lightning McQueen: [on the starting line of the Tokyo race] Speed. I am speed. Francesco Bernoulli: Ha ha ha! Really? You are speed? Then Francesco is TRIPLE speed! "Francesco... he's triple speed!" Ho oh! Francesco likes this McQueen! He's a really getting him into the zone! Mater: I'll have some of that there pistachio ice cream. Sushi Chef: No, no. Wasabi. Mater: Oh, same old, Same old, what's up with you? Mater: [after being served a whole plate of wasabi] Now that's a scoop of ice cream. Sushi Chef: [in Japanese] My condolences. Mater: Do not try the free pistachio ice cream! It done turn! Mater: [Approaches Guido, who is tending the bar] Hey, Guido, what's McQueen's usual? Guido: [In Italian] How am I supposed to know? Mater: Perfect! I'll take two! Finn McMissile: The engine from the photo. Holley Shiftwell: It's a perfect match. Sir Miles Axlerod: How did the tow truck figure it out? Lightning McQueen: [to Mater] It's official. You're coming to all my races from now on. Sarge: [Tasting gas in Tokyo] I can't believe it! They use the same stuff like in Radiator Springs, yet it is so much better! Fillmore: That's because it's organic, man! Holley Shiftwell: [Wings suddenly stick out of her] Got it! Holley Shiftwell: They're standard issue now. Finn McMissile: You kids get all the good hardware. Finn McMissile: Siddley. Paris, tout de suite. Mater: Two of them sweets for me too. Mater: I call this move "what I accidentally did to my friend Luigi". Lightning McQueen: Wait, what do you got against fenders? Lightning McQueen: What's wrong with my fenders? Mater: Oh, for a second there I thought you was trying to fix my dents. Mater: Well then, no thank you. I don't get them dents buffed, pulled, filled or painted by nobody. They way too valuable. Holley Shiftwell: Your dents are valuable? Really? Mater: I come by each one of 'em with my best friend Lightning McQueen. I don't fix these. I wanna remember these dents forever.